We'll do the business now :D Let's get to the point, i'm selling an ultimate fat medicine. Why i said 'ultimate'? because it's really an ultimate fat maker, so effective, so efficacious. 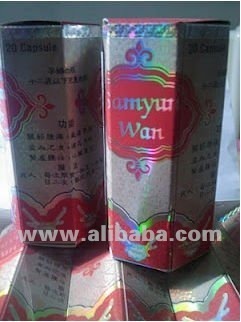 This medicine is named Sam Yun Wan . It makes you weight gaining, makes your body fatter, healthier, stronger. Sam Yun Wan is number 1 fat maker medicine, appetite and body stamina enhancer. Very very safe to be consumed, no side effects at all ! The price? Each bottle for only $4 (excluding handling fee ). Very cheap isn't it? Shove away your expensive medicine, shove away your fat milk, shove away everything you had for weight gaining, and grab this ultimate medicine. Just with 1 bottle @ 20 capsules, can improve your weight up to 7 kilos / 15 lbs !